Christi Walters, Gongos Research and Kristin Lozon, Domino’s Pizza recently took time to sit down and discuss the importance of online communities in research, along with the valuable contributions they can make to both researchers and the organization. You can read the transcript here. They will be presenting ‘More for Less: Leveraging Research Communities to Maximize Your Budget,’ during the Web 2.0 & Community Research Conference Symposium at The Market Research Event on Monday, October 19. Christi Walters is the Principal of Consumer Products at Gongos Research. As a principal and owner of Gongos Research, Christi has been integral to the growth and diversification strategy of the company since it opened its doors in 1991. Kristin Lozon is the Manager of Consumer Insights and Strategy at Domino’s Pizza. Kristin currently oversees all consumer and market research related initiatives for the company. And with that said, I would like to welcome Christi and Kristin. Kristin, first can you tell us how did Domino’s first decide that communities were an area in which they wanted to focus research initiatives? Kristin Lozon: Sure, we’re always looking for I’d say new innovative methods to help us conduct our research we are a very small department at Domino’s, so we’re always looking for new innovative ways to reduce time and costs yet still yield actionable insights and information that we can use to develop new products, services. We are aiming to get quality event from our consumers. So I was at a Market Research Event about six years ago, and there was some talk of web communities and their value and specifically I remember one conversation that I was having with the gentleman from General Motors and talking about the cost savings, quick turn around time and the value that web communities were to his organization and so I start to look into it. I found that here were some companies who had just starting using or offering web communities as more of a platform. They had the software platform offered to utilize to get in touch with your constituent, but there were other companies like Gongos that were taking it a bit further, not just offering up the platform, but also offering the tools and the insight from a research perspective, and that’s how we ended up partnering up with Gongos. I actually needed someone to help me from an innovative and research method, as well as gathering insights and helping to communicate them back to me versus just a host. What have you learned from your experiences with community research to date? Christi Walters: Oh gosh, you know it’s really surprising how much more you can really do with a research community. To give you a couple of examples, research communities allow you to have really quick turn around of information. So rather than spending weeks and weeks developing a plans and executing and ad hoc research, you can do research within a matter of hours and even days instead of the weeks that are sometimes involved. It also allows for the research company and Domino’s and some of their marketers to have 24/7 access to their consumer target. Since this is the internet, people can do it on their own time, at their own speed, in their own environment which often allows consumers to be more expressive and open with their own opinions. Sometimes they tell us stuff that sometimes were really not sure we want to know. You can also research hot topics as soon as they come up. For example, you know those ad hoc things that you’re in a meeting and someone says ‘Gosh it would be great to know this.’ [When you have an online community you] have convenient sample allows you to just run back, make a phone call, and within 24 hours you can have that topic posted and ready to go. You can also, in that same vain, you can also have some provide some critical information to support some decisions that might otherwise be made without the benefit of having research to back up the decisions. The consumer insights can be invaluable. We try to be as in touch with the consumers as possible, there are often times when a bad decision is made. A community can really help you to make really informed and good decisions. And then finally, I think communities, especially research communities really help you build a great amount of excitement. And in an essence, communities help build loyalty around brands. So with the Domino’s community, we started on an unbranded perspective, and we asked all the questions we need to ask from and unbranded, clean slate perspective, but then at some point during the running of the community, we expose that it’s Domino’s. Then our folks in the community we get super excited about Domino’s and become those brand advocates that at the end of the community, know they’ll become. In your opinion is community research as cost effective as people think? Kristin Lozon: I would say it’s probably even more cost effective than people think. I mean you can put together the dollars and cents and I can talk to that in a minute, but I would say it goes beyond just the dollars and cents. And in terms of value, it’s more than just the money, it comes down to the time savings, and also the connection you have with you consumer base. And this is one way you can actually feel like you’re getting real insight from them from various different methods of approaching them. You not only can get information back like you would form a survey, but you have dialogues and online chats. You really hear what they have to say and what they’re thinking in their own words. We also have a part of the community called the ‘Coffee House’ where they can talk to each other. And it’s amazing how much you can learn by seeing what they have to say to each other. So you’re really getting the real side of the consumer and getting to know them. And that’s I think is the most valuable, and that was something that we really wanted to do. (We wanted to really know and understand them from) where they live, and how they speak versus how they speak versus just answering our survey questions. And so it’s really hard to put a dollar amount on that, but I would say, since people are really interested, in terms of dollars and cents if I look at our research budget, I probably wouldn’t have been able to gain half the insights that we typically were able to gain through the community. If we put together some of the qualitative dialogues and quantitative surveys that we’ve done over a year, and add that up to about 90 different topics through both qualitative and quantitative. The cost to research those same topics on an ad hoc basis, we’ve probably saved over half a million dollars in one year. How have you been successful in measuring the effectiveness of your research initiatives in communities? Kristin Lozon: I would say from a Domino’s perspective, the continuous involvement and interest from our executive team, as well as my peer group from various departments, we get question that people ask us to pose to our community members, from product development to brand managers to our operations team, so we’re getting question from various departments continuously. They are very interested in and excited to receive the reports. We’re adding more and more people to our distribution lists for our summary reports, and you know they’re reading them because they come back with additional questions. This is just awesome, we love to have this happen. So I think from that perspective, we know that the internal constituents are very happy and interested in it, so that says to me that it’s been very effective. Gongos actually helped us promote the community through the organization by providing us with little Post-It notes that had the name of the community on it. So what we did was after presenting insights from the community, we passed the post-it note to the, a deck, to each person in the room. There were 50 or so people in the room at a time. We gave them each a stack of post it notes. And we said ‘Hey, whenever you have a question that you need to ask, or that you want to know the answer from the consumer, just write it on the Post-it note and drop it by my desk.’ It was amazing how many people came back for more Post-It notes, how many Post-It notes were at my desk. So you know that people are utilizing it and that they’re getting valuable information from it. Christi Walters: And I would say from a Gongos Research perspective, one of the ways we’ve been able to measure the effectiveness of the communities, and oftentimes, we’ll engage with a client for a six month period. Where they’re not sure if its’ going to be going for a year, so we say, OK Let’s try it for six months. And I say a hallmark for success is the majority of the time, our clients will up it for a year period. The other hallmark of success for research communities is the creativity that we’re able to do. We’re able to not only do the basic dialogues or surveys, but we have really spanned the gamut of what we’ve been able to do in terms of product placement, executive chats, some booster sells in key cities where we can go and do in-person research. We’ve done countless other very creative elements of research and really added to the essence of what a research community can give you. So that’s kind of how we measure success. We’ve been so blessed with clients like Kristin, who have allowed us to stretch the parameters of what a typical research community can do. And every time we stretch, we learn a little bit more. And as we learn a little bit more I believe our communities become more effective. Kristin Lozon: One other thing I’d like to add, I think I kind of glossed over it, it’s very important. I know that the community is successful and that people believe in the information they’re getting because we’ve used it to make some really critical decisions in the organization. I think that’s very important to note. We have actually tested some scripts or early stage advertising and we’ve made go/no go decisions based on the results from that. We’ve tested some new product and promotional ideas and again, made some changes to what we were going to originally produce or launch or scrapped it all together or when there’s different direction based on the information we’ve learned from the from community. Do you think community research is here to stay? Christi Walters: You know I’d say absolutely. We’ve been doing research communities now for five years. We’ve learned a ton over the five years. And now we’re just beginning to understand more of the breadth of the research applications that you can do via community. We’re really careful to say that this isn’t a one-size fits all. It’s not a solution for every kind of research. There’s still a place for the traditional marketing research approaches that we use. We are using research communities as a platform for understanding consumer needs, understanding how products fit into their daily lives, having respondents interact with products, using them to co-create with clients like Domino’s, and spurring new and innovative ideas, we use them to evaluate concepts and advertising. We’re able to bring into media feeds, and allow people to react to what may be going on in the outside media. And as the years go on, we’re finding that even more and more creative applications to use the community for. In fact, I think as we think into the future, our research, innovation and technologies team are thinking ahead and we’re adding on to the platform. We just launched the 2.0 application of the platform. With many many enhanced applications such as social networking and easier ways to manipulate the data from a user perspective. As we look further into the future, there may be applications where you can use your telephone devices, and enhanced ways to put on visuals either still photos or digital video interfaces, so there are many many applications as we move into the future. Kristin Lozon: From a corporate perspective, I would as, as timelines are constantly shortened, we need to continually innovate. It’s very helpful to tap into the voice of the consumer and have them help us better understand their needs. It really shortens our development process considerably; I don’t see that changing anytime soon. Consumers know more and want more and expect more from companies. And for us to be able to truly engage with them at a level that we really can’t do for other methods, and for us, certainly, and for the decisions we’ve been able to make with it, web communities are here to stay. Dr. Edwin Boswell is President and Chief Executive Officer of The Forum Corporation. In addition to his duties as CEO, Ed advises senior executive teams involved in major organizational transformation initiatives. His clients include DuPont, Department of Homeland Security, Merck, Ciba-Giegy, Mellon Financial, Campbell Soup, CIGNA, and Tyco Electronics. Prior to joining Forum, Ed led sales and service teams for IBM and served as an organizational consultant for Human Systems. Ed earned a B.A. in Psychology from the University of Texas at Austin. Additionally, he earned an M.A. and a Ph.D. in Psychology, as well as The Wharton School Certificate in Business Administration, all from the University of Pennsylvania. Ed’s accomplishments have been recognized by a President’s Award from DuPont Mexico and a Forum Chairman’s Award. A recognized leader in the field of performance improvement, Ed is often quoted in the press on issues relating to leadership and organizational performance. Ed’s biography courtesy of Forum.com Join us for Ed’s concluding keynote, “Don’t Miss the Finale on How to Make Your Ideas Happen…Make Customer Strategy a Reality: Moving from Vision to Execution” at NACCM 2009! The goal of most online retailers is to boost customer engagement, and many believe that customer reviews were the best tool in driving engagement. One thing for sure is that businesses will have to learn to favor social media and not step away from it because there are no signs of it going away anytime soon. Here’s a chart below from eMarketer that depicts the most popular online social tools used by retailers. Enjoy! California Fives, a new online community for potential travelers to California, taps locals and celebrities to help potential visitors what are the five best of any part of their state to visit. This adds to the current arsenal of Visit California, which also includes Twitter, Facebook, and specific areas that cator to the different regions in California. Read more about the new initiative at PR Week. Many states are jumping on the social network bandwagon. Do you think the additional of social media will help potential travelers? Hearing first hand from natives about what they enjoy in their state could shed exposure on local gems, as well as reaveal the real culture of some cities to interested travelers. Have you used a website like this to plan a vacation of yours? 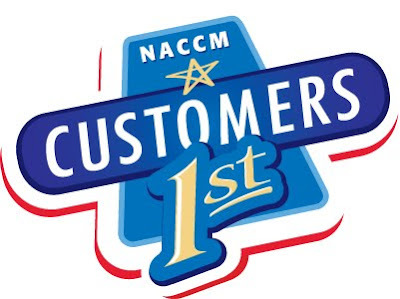 As we get gear up for the 2009 NACCM: Customers 1st Event this year, we’re going to be interviewing and getting to know the speakers and sponsors who will bring their perspectives on customer service to you. We recently sat down with KenPowaga, Senior Vice President at GfK Custom Research North America. He will be presenting his keynote speech, ‘Profiting from Customer Churn’ at this year’s conference. Download the NACCM:Customers 1st Brochure to find out more about the program this year. Eric Ries recently wrote a great article for Vator News discussing the importance of listening to your online community. Although we see many articles today that discuss the importance of listening to your online community, it’s still a much tougher job to commit to. Many times, listening to the customers can be a defeating, trying process. They also need to understand that you’re taking the time to listen to their opinions. Listening to the community is much like dealing with customer service. While you have great contributors who constantly interact and provide great information, many others will complain and criticize about your product you’ve worked hard to launch. How do you make sure that your community realizes you’re listening to what they have to say? In the weeks leading up to The Market Research Event 2009, we’re going to be hearing from the speakers of The Market Research Event. This week we have Phil Roos, Managing Director, Arbor Strategy Group ‘ GfK Strategic Innovation, who will be presenting “See the Future: Deciphering Innovation Patterns to Find Tomorrow’s Opportunity Space,” in the Insight Driven Innovation Track on Wednesday, October 21, 2009. To learn more about The Market Research Event, download the brochure here! 1. Tell us about a project you are working on or recently completed that you are proud of? Phil: I am really proud of some work we have been doing for a client (sorry, I have to disguise it) in the health and beauty space, where we have been able to predict and model what type of truly disruptive innovation will emerge and be successful over the next 10 years, and in different parts of the world. There is some really game-changing stuff on the horizon! 2. Think ahead 5 years, what major changes for MR/Consumer Insights do you see? Phil: I believe that the industry will take on a very different shape than it has today. There will be an integration of techniques that go well beyond the traditional, using web technology to reach out to a much broader set of consumers and explore their needs and where they are headed in a much more in-depth and real time manner. There are exciting implications for being able to define tomorrow’s innovation, versus just measuring what people think today. With so much new information out there, the winners will be those who can best synthesize the inputs into something coherent and actionable. It will be an exciting time! 3. What inspired you to get in the field? What keeps you motivated? Phil: I like solving difficult problems and, though it sounds corny, I like helping people ‘ and this field is as close as you get to a truly ‘helping profession’ within the world of business. The Institute for International Research is excited to announce that production of the Achieving Customer Relevance conference is underway. We will be reviewing presentation submissions until September 21st ‘ space is limited so please submit your ideas TODAY! This three-day event is the destination those looking to understand how to reach targeted life styles and stages. From the segmentation to the marketing, explore best practices for pinpointing innovative ways to deeply connect with profitable segments, growing segments and new segments to maximize lifetime value and achieve sustainable growth. ‘ Products Across Life Stages- Which Ones Succeed and Why?